Kelly has practiced as a commercial litigation paralegal for more than a decade. 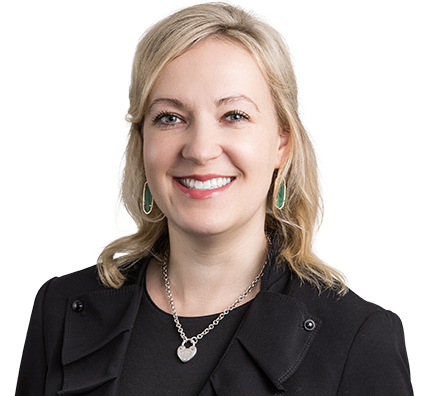 Her commercial litigation experience includes toxic tort, medical malpractice, labor and employment, and intellectual property cases in federal and state courts around the country. Kelly enjoys helping lawyers handle litigation in an efficient and cost-effective manner. She assists with tracking deadlines in cases for which she is lead paralegal and with docketing all case deadlines. She also assists in preparation of draft pleadings; initial drafts of discovery; discovery intake, including handling of document productions both offensively and defensively; motion practice; analysis of local rules in the case jurisdiction; pretrial preparation; and trial. Kelly has mastered technology relevant to litigation, including CompuLaw and Relativity, and she stays abreast of current technological developments relevant to effectively running commercial litigation. She is skilled at using docketing software to track all court deadlines. A copyright infringement case involving an ornamental design on a shoe. The jury award to our client was $2.2 million. A case filed with the U.S. International Trade Commission by Emerson Electric against Anaheim. Emerson alleged Anaheim sold garbage disposals that copied inner mechanisms of Emerson’s products and infringed its patent and trademark. A case that marked the first time the Federal Circuit reversed a Patent Trial and Appeal Board final written decision in an inter partes review case. Cases involving extensive discovery, including class action labor disputes involving management of large-scale document productions and document review of productions, and case strategy meetings. A case in which Numatics Inc. prevailed in a patent infringement action following four successful Daubert motions. Assisted in successfully defending senior care facility against claims of failing to properly accommodate patient’s deafness. Judge dismissed four of the plaintiff’s claims on a successful motion for summary judgment; federal jury returned a unanimous defense verdict on the remaining six claims.